NEC Display Solutions of America is now shipping the latest Open Pluggable Specification (OPS) compliant computer for integration into the built-in OPS expansion slots of NEC’s V, P, and X Series displays, and E705, E805, and E905 models. NEC Display PX and PH Series projectors also are supported. 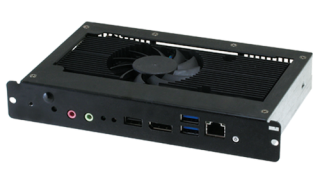 The OPS-APIC-PS PC features a 2.2GHz dual-core CPU based on the fourth-generation Intel Celeron 2000E architecture, designed to provide high performance and efficiency for a variety of signage needs. With a full Windows 7 Pro license, it enables full use of Windows-compatible peripherals such as touchscreens and web cameras. This PC features a 65GB SSD hard drive, gigabit ethernet connection, two USB 3.0 ports, a USB 2.0 port, DisplayPort output, and 4K resolution support as well as a microphone line in for additional connectivity. The OPS platform is an industry-wide standard for the design and development of digital signage to simplify installation and maintenance. These internal PCs can run multiple video formats and are targeted for use with digital signage environments including airports, quick-service restaurants, education, rental and staging, corporate lobbies, healthcare facilities, and retailers.